Handmade cymbal set with excellent sound! Cymbals are the acoustic highlights of the drum kit. With Crash-Cymbal, China-Cymbal, Splash-Cymbal or Effect-Cymbals you set accents, while Hi-Hat and Ride-Cymbals set the pulse in the beat. Cymbals are produced in different ways, on the one hand there are completely machine-made cymbals, but on the other hand there are also cymbals that are made exclusively by hand. And in between there are all kinds of mixed forms, for example that the blanks are machined but hammered by hand. 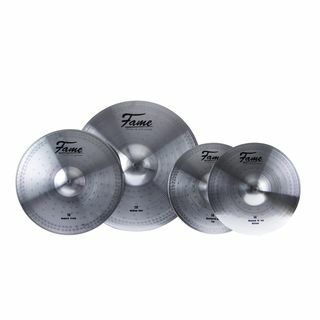 Because cymbals are made of a very special material whose composition is such that they should crack on the first impact, a great deal of know-how is required to assemble and process these alloys in such a way that the cymbals are durable and can also withstand violent impacts in the long term. Sound differences can also occur within the same cymbal type - each cymbal is almost always a little different in sound than a cymbal of the same construction. The deviations can be greater with completely handmade cymbals than with machine-made cymbals. But you also have the chance to get an individual cymbal with unique sound characteristics, which is not available for a second time. Nevertheless, all manufacturers make sure that within a series cymbals always have certain sound characteristics. Therefore, one can assume that the sound differences are usually not that noticeable. If you test the cymbals of the Zildjian custom series, for example, you will notice fine differences in the sound that underline the individual character. Nevertheless, all cymbals of this series sound like "one piece". 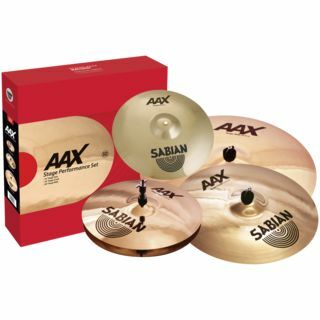 Many manufacturers offer their cymbals as sound coordinated cymbal sets, in which not only all cymbals fit together, but which also offer a small price advantage. Always included are a pair of HiHat cymbals and a Ride cymbal, which are usually completed by one, but sometimes two matching Crash cymbals. Proven standard sizes are 14" for the HiHat pair, 20" for the Ride and 16" and/or 18" for the Crash cymbals. Of course there are also sets with other sizes, although those are not as common. The most common size here is 14", but of course there are also larger and smaller HiHats. To prevent the two HiHat cymbals from clinging to each other, the lower HiHat cymbal should be slightly tilted using the angle adjuster on the HiHat stand, so that the air can escape to the side and no vacuum can develop that would hold the two cymbals together. Some manufacturers have a different solution for this, by providing the lower cymbal with a wavy edge or simply drilling a few holes into it. With the Ride-Cymbal the basic beat is played, if it should carry longer, for example with ballads or in Jazz styles. The standard sizes of Ride-Cymbals are 20" or 22", depending on your preference, and there are also 21" Rides. Larger Ride cymbals are not only heavier, but also sound really heavy and deep. An important part is the cup, which provides bell-like accents, hence the English name "Bell". This sound is very easy to play on most Ride cymbals and carries farther than the cups of Crash cymbals. If you don't need the sound and like flawless Ride sounds, you can also look for a so-called Flat Ride cymbal that doesn't have a cup at all. Most Ride cymbals still produce a clear "ping" sound even when played very loudly. But if you like it more noisy and want to create crash-like beats, you should try either a thinner Ride cymbal or a Crash Ride that is designed so that beats at the edge don't just roar loudly, but create an acceptable crash. Crash cymbals set accents, common sizes are 16", 17" and 18", they are available in any size from 13" to 20". 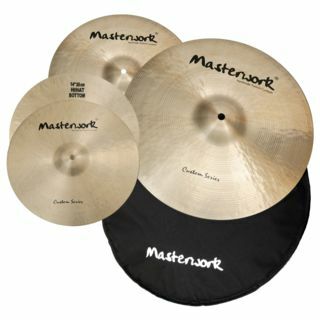 The thinner Crash cymbals are, the faster they respond and also react well to soft playing. Thicker cymbals need more punch to develop their full sound. In return, they produce more treble and are also well accepted in loud bands. In rehearsal rooms, studios or smaller clubs, Crash cymbals with a smaller diameter are more recommendable, but live and especially at big events, larger and thicker crash cymbals have proven their worth. China cymbals have a bent edge and often an angular shaped cup. Because the rim is bent, they are mounted upside down. In principle, they provide crash accents that sound very trashy and broken and mostly very loud! So they are suitable for especially violent accents, which should be used only at a few places in the song, otherwise the sound wears out with the audience and doesn't provide the high attention in the beginning. Splash cymbals are actually crash cymbals with 12" and less diameter. They are usually very thin and offer a high and fast decaying crash sound, which used to be used in jazz, but is also popular with pop and rock drummers, when unusual accents should be set, which don't sound as loud and broken as a China. 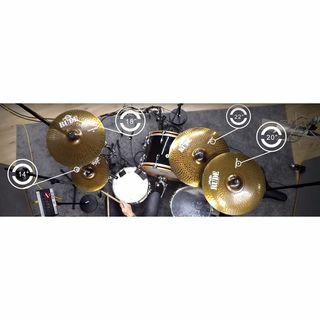 With effect cymbals you can create really unusual sounds. Metallic sounds, which are rarely heard and can sound very spacy, enrich every drum kit with a wide variety of effect cymbals. The Spiral Trash by Zildjian, for example, which looks like it has been cut up with a can opener, produces very wacky sounds. Effect cymbals are often "decorated" with holes and slots to create a certain sound. Here you can also find bell cymbals, which actually only consist of the cup of a Ride cymbal, or gongs, which should be played with a thick felt or rubber mallet. In order to achieve a simple effect sound without special cymbals, you can also try placing a splash directly on a crash. Percussion cymbals that can also be played by hand can be found in the shop category Percussion.